I was umming and ahhing whether to include this beer in the Summer Fruit Beers section. After all, Kakadu is a region not a fruit... That being said this beer uses 27 different fruit and spices found in Kakadu, none of which have been listed however. 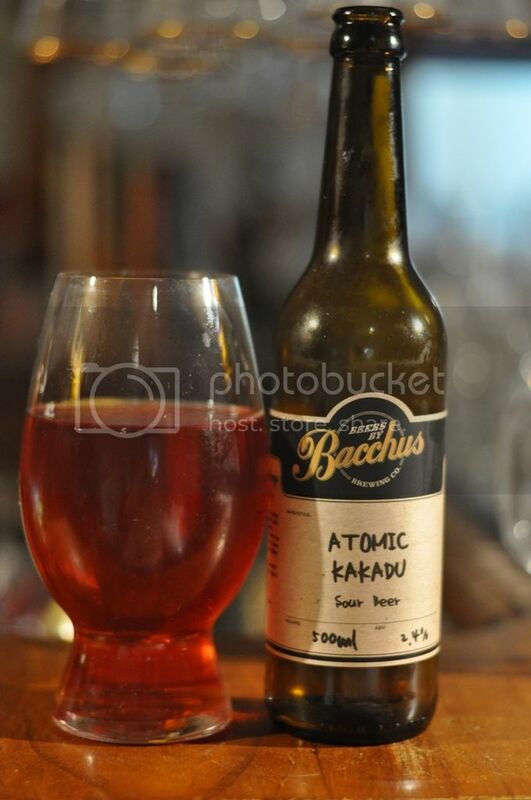 To say Bacchus Brewing's Atomic Kakadu was an atypical looking beer would be an understatement! It looks almost like cordial, in that it's a relatively clear pinkish orange colour with no head even 10 seconds after pouring. For about 5 seconds there was half a finger of red tinged foam, although it was incredibly shortlived. It's a truly unusual looking beer! Onto the nose and the most obvious element straight away is the unmistakable tart aroma of lactobacillus. This is accompanied by a berry-like aroma, not hugely dissimilar to blackcurrants. There appears to be a herbal, almost eucaltypus element as the beer warms but it is hard to be sure as the tart berry aroma is quite strong. As the nose indicated this beer is lovely and tart, with this unusual fruitiness also quite strong. There's some herbal characteristics as well as the beer warms but mostly all you get it sourness and berry fruitiness. The berry itself tastes quite tart and is similar to blackcurrants or blackberries or riberries. I can't put my finger on what it is, but it's certainly interesting and makes for a lovely sour. Overall I thought this was a really nice fruity sour. The distinctive lacto flavour was complimented nicely by the unusual berry flavour. At only 2.4% it's a beer that you could drink all day! I've got a few more of the Atomic range from Bacchus, so keep your eyes out for more Bacchus sour reviews in the not too distant future.